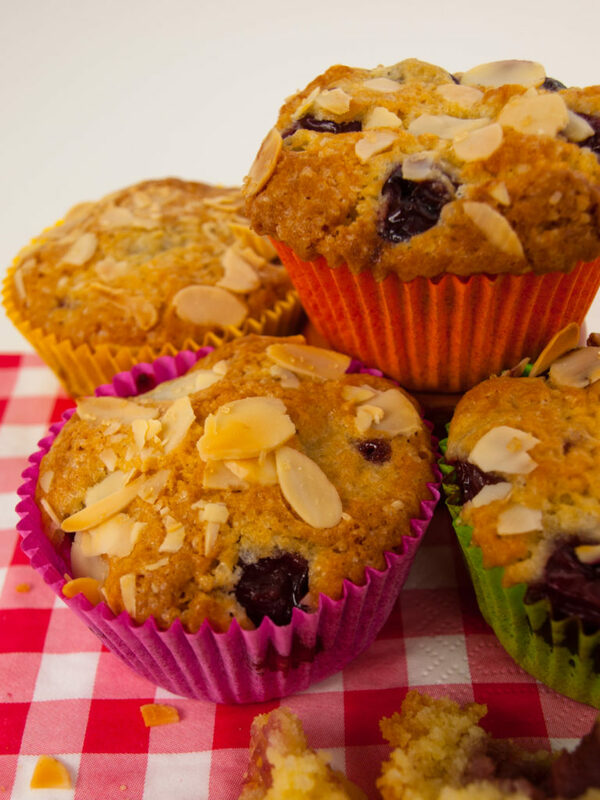 Dig into these incredibly juicy and scrumptious cherry muffins! As you may have already realized by now, I’m not the biggest one on desserts. My arsenal of tasty dessert treats is rather limited, but this one is my all-time-favorite when it comes to muffins! A little portion of heaven with juicy cherries, a hint of vanilla and lime, as well as a nice little crunch on top from the almonds. The recipe is super easy to make and there is no way you could ever mess this up. You can whip up these bad boys in no time at all and most of the ingredients will probably be in your pantry anyway. I don’t have a dishwasher and -to be completely honest- am rather lazy from time to time. In order to reduce the amount of dirty dishes, I use the same pot for melting the butter also to mix the batter in. Less dishes to wash = more time to indulge on muffins! If you want to do this as well, choose a pot that is big enough to hold all your ingredients in it. And now get baking! It’s time to treat yourself with one of these little divine muffins! Preheat an oven to 160°c (fan works best). Line the molds of the muffin tray with paper cups. Put a pot on medium-low heat and melt your butter in it. Stir occasionally and make sure the butter melts but does not brown! Once fully melted, let the butter cool for 3 minutes. Drain the cherries and mix them with the lime juice. Add the flour, sugar, eggs and vanilla sugar to the melted butter. Using a hand-mixer (or your trusty old whisk) bring the batter together and make sure everything is well combined. This is your batter. Add one tablespoon of batter into each muffin mold as a base for the cherries. Place a layer of 5-6 cherries in each mold. Push them slightly into the batter. Divide the remaining batter across the muffins on top of the cherries. Sprinkle some almond slivers and brown sugar on top of each muffin. Put your muffin tray into the oven and bake for about 25 minutes. Ovens and muffin-trays differ a lot, so please check regularly after 15 minutes how much the muffins have browned! Let your muffins cool slightly before digging into your little divine pieces of heaven! Let me know what you think about these little goodies in the comments below! Did I over-promise? Do you think another sort of fruit would work even better? As always, all your comments are welcome!